Regularly counsels international automotive manufacturer on all phases of manufacturing process, including direct/indirect procurement of parts and services, equipment and tooling, antitrust compliance, and supply chain disruptions. Counseled food distributor in multi-million dollar sale of assets. Counseled solar developer in multi-million dollar purchase of facility. Counseled private equity fund in multi-million dollar purchase of over 100 franchise locations. Counseled biotechnology company in multi-million dollar sale of assets. 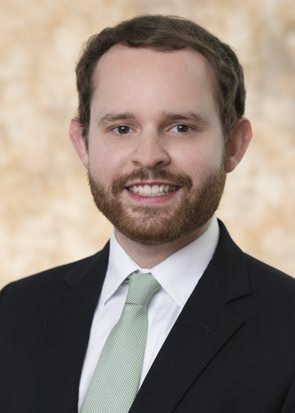 Sam counsels domestic and international entities in areas including mergers and acquisitions, complex commercial contract negotiations, and antitrust regulations. He works with clients in a variety of industries and specializes in advanced manufacturing--particularly the automotive industry. Sam practices with the firm’s Corporate & Tax Group. He regularly represents clients in a variety of corporate and commercial matters including entity formation, corporate governance, mergers, acquisitions, recapitalizations, and contract negotiations. He also advises clients on antitrust, intellectual property, and corporate regulatory matters. Sam spent over a year in a secondment position with the legal department of an international automotive manufacturer, where he gained significant experience negotiating complex commercial transactions. Having learned firsthand what clients expect of outside counsel, Sam seeks to provide solution-oriented counsel that is delivered efficiently. Prior to his legal career, Sam worked for the Economic Development Partnership of Alabama. At EDPA, he developed programs to grow start-up companies and consulted on workforce development issues facing some of the state’s largest corporations. Sam received his Juris Doctor with honors from the University of Alabama School of Law, where he was a Dean’s Scholarship recipient. While in law school, he served as a Senior Editor of the Alabama Law Review and as a member of the John A. Campbell Moot Court Board. Sam won a national award for oral advocacy in the National Tax Moot Court Competition. He also worked as a Research Assistant to Professor William Brewbaker on his forthcoming textbook, Christian Legal Thought.